Every year when the summer fruits begin to dwindle, I panic and buy up big on stone fruit at my farmers’ market. We gorge ourselves on the fresh stuff while we can. Some might make it into a vanilla laced pound cake, where its colour runs into the sweet crumb and provides welcome acidic relief. The rest, then, gets cooked and frozen, to be eked out over the following months and served up to brighten wintery days. Roasted plums are our absolute favourite, though apricots (which I do a batch or two of earlier in the summer) run a very close second. I like mine stirred into porridge or served over natural yoghurt (both the porridge and yoghurt are products of the steam oven too, I promise we’ll get to them another day), though I’ve also been known to stand alone at the open fridge and sneak a few spoonfuls straight from the container. Ice cold, silky and with syrup dripping off the bottom of the spoon, I think that might be my favourite way to enjoy it. And every time I do so, I hear my mother’s voice telling me to shut the fridge before all the cold air comes out, which may or may not be a reminder of how frequently I stood gazing absently into one as a child, hoping something delicious might materialise from its depths. My husband approves greatly of the fruit/yoghurt combination but prefers his porridge minus any ‘bits’. He loves roasted fruit best over vanilla ice cream, where the sharp juices run into the milky puddles at the bottom of the bowl. I’m not sure he knows about my predilection for open-fridge food sneaking, and I’m hoping to keep that to myself. Ha. My niece turned one and we had a party. As official designated celebration-cake-baker in our family, this means I was awarded the privilege of making a girly, confetti-sprinkled, big happy cake for the occasion. It also means we had houseguests all weekend, as my sister isn’t a city-dweller these days but arranged to have the party nearby so family and friends could come. My son, who adores his younger cousin in the huggy, chatty and occasionally pushy way only a toddler can, was beside himself with joy and we had gorgeous small-child chaos for three solid days. It was great. It’s almost Easter! Bring on the free reign to eat, bake and buy as much chocolate-related goodness as is humanly possible. If only I had a spare ten or so hours before the holiday weekend I’d be hauling out my prized but rarely used tempering machine to make my favourite burnt caramel ganache truffles. As it is, the growing stockpile of tiny chocolate eggs in the pantry and a few more batches of hot cross buns will have to suffice. There’s always next year, right? More an idea than a recipe this week, so the quantities and times given below are subjective. Adjust them as you see fit – this amount of fruit will give you easily enough for 8-10 servings, maybe more. It freezes really well, though, so I like to make a lot and do that. 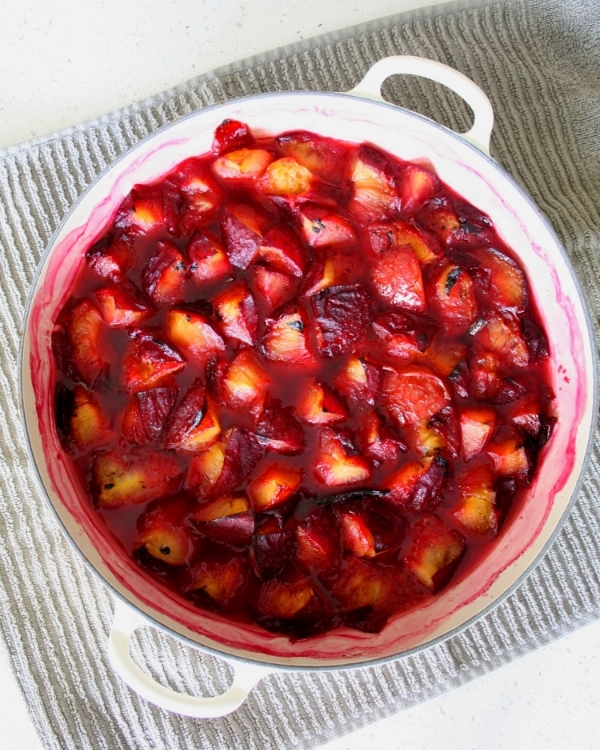 I think most of us know how to stew fruit in a saucepan, but some fruits, particularly stone fruits, benefit more from roasting than being piled into a pot and cooked over direct heat. The oven intensifies the fruit’s flavours, making it slump down into itself and lending little browned bits to the topmost pieces. You can cook it just enough to soften without completely losing shape, or (as I’ve done in today’s photo) let it go a bit longer so it partially breaks down. There’s no right or wrong – I prefer my apricots, peaches and nectarines a little firmer, and my plums super soft, but it’s entirely up to you. Set your oven to 180˚C on combination steam. If your oven has variable steam settings, use 100% steam. Put all your fruit into a dish where the pieces can be packed in fairly snugly. If you have enough space, lay it in cut-side up. If you went a little overboard on your fruit quantity, like I often do, just tuck it all in standing on end. Halve the vanilla bean and tuck it under the fruit. Sprinkle with sugar – in general, I find the plums need a little more, other fruits a little less. I prefer to err on the side of less sweet so rarely use an entire half cup. And I’ve done very sweet apricots with absolutely no sugar, which was just fine although the lack of added sugar means they only last a couple of days in the fridge. Put the dish, uncovered, in the oven and cook for around 20 minutes, after which the fruit should be bubbling, softened, syrupy and just starting to brown at the edges. If it’s not soft enough for you, put it back in for a few more minutes. Cool to room temperature in the baking dish, then transfer to the fridge for up to 4 days or the freezer for a couple of months. *But I don’t have a steam/combi-steam oven! You can roast your fruit at the same temperature in a conventional oven, with similar results. Stone fruit gives up quite a lot of juice as it cooks (especially plums), but conventional oven heat does evaporate a lot of this away. If you want it to be syrupy, you will need to add a touch of water (try 1/3 cup to start) to the dish before you put it in to cook. Keep an eye on it and add a little more if the pan looks dry.